Aquatherm’s PP-R pipe offered all of the benefits of plastic (cost savings, easier installation, improved flow) without any fumes, glues or chemicals used during installation. ""For the first time since November 2009, a U.S. supercomputer sits atop the TOP500 list of the world's top supercomputers. Named Sequoia, the IBM BlueGene/Q system installed at the Department of Energy's Lawrence Livermore National Laboratory achieved an impressive 16.32 petaflop/second on the Linpack benchmark using 1,572,864 cores. 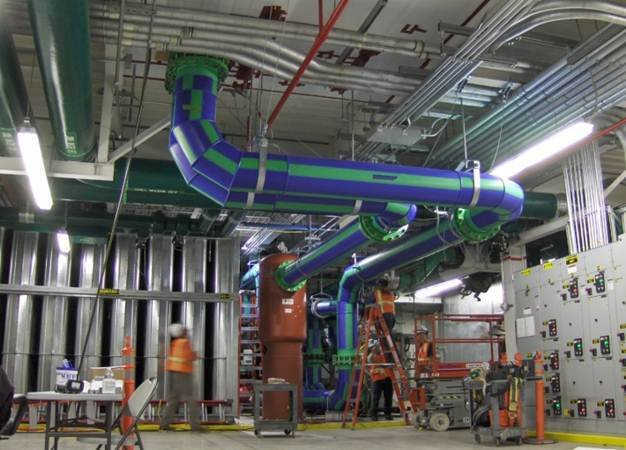 Sequoia is also one of the most energy efficient systems on the list...""
Specifying and installing a piping system for the data center housing one of the world's most powerful supercomputers. In an effort to achieve this mission, LLNL has continually sought to lead the world in terms of computing power. According to TOP500® Supercomputers (http://www.top500.org/), LLNL realized that goal, but was surpassed by Oak Ridge National Laboratory’s Titan in November. Sequoia was also rated number 1 on the Green 500TM. In designing Sequoia and its supporting infrastructure, LLNL’s engineers sought a compact physical footprint while also using LEED Gold certification as a guideline. When designing the cooling system, LLNL engineers were primarily concerned with addressing potential cost savings in the piping material. While the computer manufacturer initially required that the piping be either stainless steel or copper, LLNL engineers developed a plan in conjunction with the computer manufacturer to research the use of plastic piping alternatives. The engineers also needed to mitigate fumes and particles that would have been introduced into the space during the process of welding metal pipe. While this specification ruled out metal pipe systems and limited the options to plastic, a side benefit was that using plastic piping would provide better flow rates. LLNL officials were aware of a number of highly engineered plastic pressure pipe systems, but were only vaguely familiar with a proven yet new-to-North America pipe system: Aquatherm. EMCOR Services Mesa Energy Systems (Hayward, CA) was one of the bidding mechanical contractors and had recently been introduced to the German manufactured Aquatherm pipe. With nearly 30 years of experience in HVAC maintenance, service, building automation systems services, and commercial HVAC and retrofit contracting, EMCOR/Mesa has earned a reputation for innovation and providing value to customers. EMCOR, working in conjunction with LLNL engineers, decided to use Aquatherm. Once all the factors were considered, this resulted in roughly $2 million in project savings. Aquatherm’s polypropylene-random (PP-R) piping systems are connected via heat fusion, which is a big factor in their reliability. Heat fusion bonds both sides of a joint into a single, homogenous material without the use of chemicals or mechanical connections, eliminating systematic weaknesses and fail points in the pipe. Serving as the prime contractor on the job, EMCOR/Mesa and their subcontractors participated in a factory training provided by Sustainable Building Products and Aquatherm at EMCOR/Mesa’s Hayward, CA, shop. Completing this training allowed EMCOR/Mesa to offer Aquatherm’s standard 10-year multi million dollar warranty, which covers product liability, personal injury and property damage, to LLNL. EMCOR/Mesa Executive Vice President Mike Echsner engaged a carefully selected team that would eventually design and build the project. The team included Rick Russell with Interface Engineering (pipe system engineering); Bockmon & Woody Electric Co., Inc. (electrical installation); and Air Systems, an EMCOR Company, (automation system installation). Two Bell & Gossett plate and frame heat exchangers and two 150-hp Bell & Gossett pumps formed the backbone of the mechanical system, with an Automated Logic digital control system running it. The heat exchangers are sized for 75% of the load at 30 million BTUH each. The computer manufacturer had established strict water treatment requirements for the cooling system and Aquatherm’s chemical inertness played a key role in meeting that requirement. Due to the chemical purity of PPR, the system was not exposed to any foreign oil or material from the pipe. If steel had been used, the cooling water would not have met the specification due to oil residue. Also, had PVC been used, there was a risk that the glue overflow could have clogged the computer coil. The mechanical team did experience a learning curve in working with the fusion connections, but overall the installation went quite smoothly. Installing Aquatherm allowed the designers and installers to comply with the specifications of plastic type piping and deliver a good product to the lab in addition to helping LLNL achieve Environmental Management Systems (EMS) goals and standards. The decision to use Aquatherm pipe is also expected to assist in the facility’s 2015 LEED™ point recertification. Additionally, the Aquatherm installation went so smoothly that LLNL recently installed the PP-R pipe for the cooling system of Vulcan, a smaller version of Sequoia designed to provide a resource for industrial collaboration. Aquatherm Blue Pipe moves 1.2 million BTUs generated by five 399,000 Btu condensing boilers at this pig barn. Aquatherm pipe in sizes ranging from ¾-in. to 24-in. was installed at the Seminole Hard Rock Hotel & Casino. The 22-story Windsor Over Peachtree condominium building features commanding views of downtown Atlanta and the surrounding area. Aquatherm pipe in place at Windsor Over Peachtree. Its virtually leak-free performance impressed the installing contractor.